The social campaign “From Heart for Grandparents” is organized in the period December-January, aiming to bring light and hope in the house of elderly people with a precarious financial situation in the eve of winter holidays. The activity also comes to draw the community’s attention to the need for help, care and a warm word, that most elderly are missing. 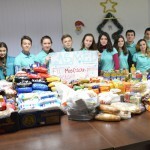 The volunteers collect pasta, oil, buckwheat, rice, sugar, canned food, sweets, vegetables and hygiene items, which are subsequently packed and distributed to elderly. The campaign “Plus of Health” is organized on the 1st of October in Bălți town, and has for purpose informing the public about the risks brought by the chronic non-communicable diseases (cardiovascular diseases, diabetes and obesity, lung disease, cancer). The mentioned diseases are in the top of main causes of death in the world. According to the statistics of World Health Organization, globally, about 36 million people per year die from non-communicable chronic diseases.